For me the biggest blessing of all is getting to know these people.? 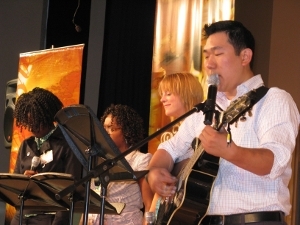 It�s a special time to hear their stories as they begin in full time ministry.? Many of them have done internships on campuses around the country, some working with different people groups (like internationals with our ministry Bridges,? Asian students with Epic, or African American students with the Impact Movement).? ? ? I feel privileged to have met them and worked with them. You can pray for them to continue to be able to manage their full schedule for New Staff Training with the addition of extra practice hours for leading worship.? 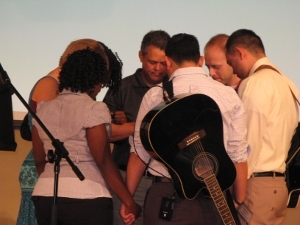 And of course, pray that their service would help all the new staff worship in the midst of such a daunting schedule. Another neat thing is that, through Facebook, they have formed a community for communicating important info, like practice times, but they�ve also used it to build themselves into a community and are building friendships as a group 😉 .? God is so good! 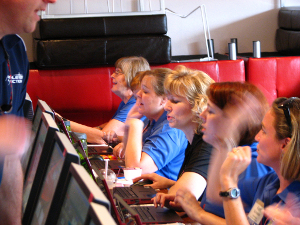 These ladies are helping people get checked in as they arrive for four weeks of training.? This was our biggest registration to date, with about 600 people coming through.? We make sure they�re set up with housing, meal plans, and childcare for their kids. Because people can choose between class rosters that last from one to four weeks, we have a registration period almost every weekend.? My team sets up the computers and then steps back and makes sure that any problems get solved quickly. We�re already preparing for the big US Staff Conference, when 4500 people will be here for connection, encouragement, and training.? We�ll be setting up computers all over the place, and helping broadcast the conference over the web to people who can�t be here.? Thank you for your prayers! This entry was posted in Prayer Letters on July 8, 2009 by Karl.